Since this is the last season of Scandal, the show is coming to terms with the complex legacies these characters will leave behind. Sure, Olivia is a smart, independent black woman, but she’s also power hungry and capable of murder. So far, the show has done right by nearly every character, until “People Like Me.” Jake is pure evil now and it makes little to no sense. Why didn’t the show set him up as the series’ villain earlier? Why did we spend half this season with Jake helping OPA and being normal? RIP Jake’s Drunk Wife. She deserved better than that, but I’m glad we did get a final moment with her. I don’t know why she suddenly had an interest in Jake’s career or moral choices, but they brought her back just to kill her. We’ll always have “the liquor cabinet is over there” from last season. So Olivia tried to put an entire plan together to stop Cyrus, failed, and went with “Mellie should give a nice speech.” I feel like she could’ve just started there, but I guess we needed to see that Olivia is no longer the dangerous murderer the show made her out to be. The moment where Liv threateningly leans on a chair so we remember the time she murdered a man with a chair was great. Again, I do not see the moral issue with killing Cyrus, so I don’t see why Fitz and Marcus were so concerned with Mellie’s choice. Presidents have to make tough decisions and the only good concern was that it would look super suspicious for Cyrus to die. Mellie isn’t better than anyone else on this show. Why are they saying that? I like that they gave Cyrus a “I would be a bad guy no matter what” speech so we can really not feel bad when he dies. 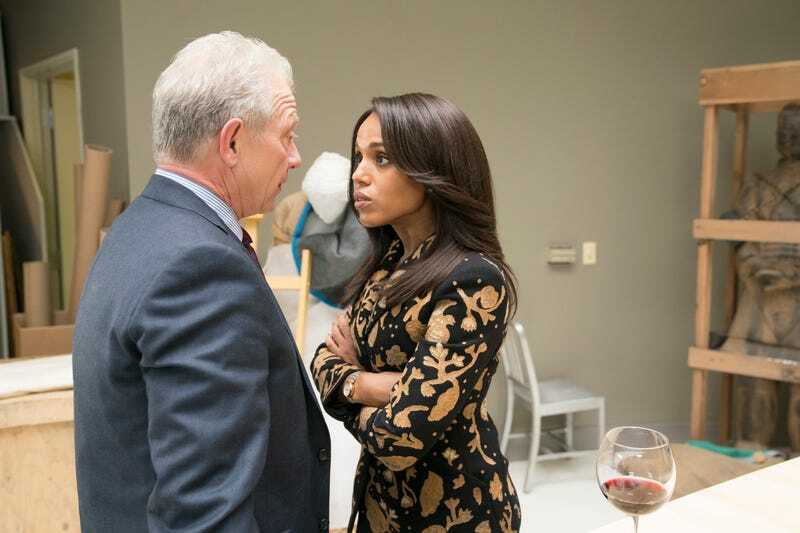 Sure, let’s have Fitz and Olivia reconnect. It’s not deserved. The show has not done anything to make this relationship seem viable at this point, but fine. The series is ending and it wasn’t going to end without them being together. It was nice to see Mellie taking charge in the White House this episode, but this feels so disconnected from her time as president earlier this season. I like that Cyrus’ hacker being dead was the end of that lead. Like, take his computers. Look for more evidence. C’mon! Huck has had it the worst this season. He still has nothing to do and the show is relying on the non-human Huck of earlier seasons. There were a lot of fans who wanted Jake and Olivia together. I wonder how they feel after tonight. Jake murdered his wife. It invalidates pretty much everything he and Olivia ever had. I usually love a drunk Mellie speech, but the one to Jake via camera was not great. Again, the show is trying to hard to tie to #TimesUp and #MeToo, but it doesn’t fit with these characters as we know them. I think Cyrus clearly sees that Jake is insane now, so let’s see how he walks this all back. It seems like Cyrus is totally off his game since he didn’t consider Olivia to be a threat. Seriously, Cyrus? You didn’t think Olivia was trying something? Poison, Olivia? That’s your best idea? Poison? Someone bring Papa Pope back so we can clean all this up and get outta here.